Vollis Simpson, windmill and whirligig genius, dies aged 94. Vollis Simpson built his first whirligig from the remains of a downed plane to power a washing machine. 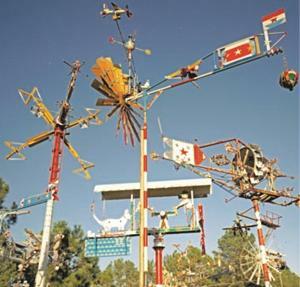 After his retirement in 1986, he erected more than 30 giant whirligigs constructed from machine parts and metal accumulated from his welding and repair business. Haunting sounds accompanied the motion of the massive, colourful steel structures, some of them over 40 feet/12 m high, which are covered with thousands of reflectors to make them shine at night. A whirligig park dedicated to his work will be opening later this year in Wilson, North Carolina. Click here to read more. 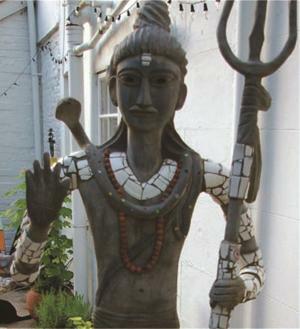 The Alternative Guide to the Universe at London's Hayward Gallery will include Nek Chand sculptures specially sent from the Rock Garden in Chandigarh, India. Other artists featured include Morton Bartlett, Lee Godie, Emery Blagdon, Eugene von Bruenchenhein, Paul Laffoley and George Widener who is giving a talk on Wednesday June 12 at 7.45pm. The exhibition runs from June 11 to August 26, 2013. Gioni took the title of the show, The Encyclopedic Palace, from an elaborate 1955 proposal by self-taught Italian-American artist Marino Auriti to build an imaginary museum intended to house all knowledge. Click here for more. 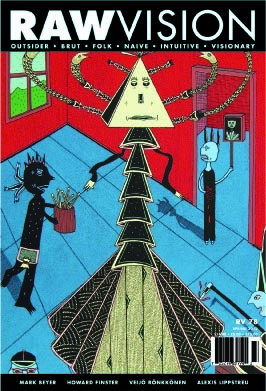 Mark Beyer's dark-humoured comic art. Veijo Rönkkönen's vast sculpture park and magnificent garden in Finland. Alexis Lippstreu's influences for his pencil-drawn renditions of masterpieces. Israele's elaborately decorated sanctuary/home on a mountain top near Palermo, Sicily. The disturbing figurative world of Xico Nico, master of imagination. The unsung sand sculptors of the late 1890s to the mid-1940s. Plus reviews of books and exhibitions and Raw News from around the world.